If your doctor suggests you may have nonallergic rhinitis what does that mean? What are the different forms of this condition and how are they treated? Non-allergic rhinitis is a medical condition of unknown cause, leading to symptoms very similar to allergic rhinitis, or hay-fever. Approximately half of the people suffering from allergies also have a non-allergic component to their symptoms. Allergic rhinitis tends to be a seasonal problem, whereas symptoms of non-allergic rhinitis are typically year-round. Allergic rhinitis tends to affect children and young adults, whereas non-allergic rhinitis tends to be more common as people age. Vasomotor rhinitis is triggered by physical conditions such as strong odors, perfumes, changes in temperature and humidity, smoke, fumes and bright sunlight. Most patients experience a runny nose, post nasal drip and/or nasal congestion. Itching of the nose and eyes is typically not present. Infectious rhinitis is typically related to a viral or bacterial infection, and symptoms can mimic a sinus infection, with facial pain and green nasal discharge. However, these patients do not have evidence of a sinus infection on x-rays. This disease process resolves on its own within a few days, and responds to oral antibiotics in severe or prolonged cases, just as a sinus infection would. Hormonal rhinitis can occur during pregnancy (pregnancy rhinitis) and in patients with low thyroid function. Pregnant women usually have symptoms of severe nasal congestion occurring during their second month of pregnancy, and this can persist until the baby is born. Symptoms typically disappear shortly after delivery. Medication-induced rhinitis can occur in many patients using high blood pressure medication, birth control pills and non-steroidal anti-inflammatory drugs (such as aspirin and ibuprofen). Rhinitis medicamentosa is related to overuse of over the counter decongestant sprays, such as Afrin (oxymetazoline), with symptoms of severe nasal congestion and runny nose. People who over-use these sprays essentially become “addicted” to the medication, needing more and more medication to control their symptoms. Gustatory rhinitis can be related to food or alcohol intake but is rarely due to an allergic cause. People suffering from this form of rhinitis experience a runny nose, usually of a clear, watery fluid, particularly after eating hot or spicy foods. Rhinitis related to acid reflux disease is particularly common in young children, with symptoms of nasal congestion, runny nose, and post-nasal drip. Symptoms may tend to occur after heavy meals, or in the morning after the person has been having acid reflux while lying flat at night. It can be very difficult to diagnose non-allergic rhinitis by a person’s symptoms alone. A diagnosis is usually based on the history of symptoms, medication use, other known medical problems, and a physical examination. Allergy testing will be negative in a patient with non-allergic rhinitis, and this testing is usually required to make sure that allergies are not playing a role in the person’s symptoms. Avoiding the irritant triggers which cause the symptoms is the best way to treat non-allergic rhinitis, but not always possible. Typically, patients with non-allergic rhinitis do not respond to anti-histamine medications, since histamine is not causing their symptoms. Medications which are at least partially effective include prescription nasal steroid sprays and antihistamine nasal sprays, and oral decongestants. Patients with symptoms of constant “dripping” nose and postnasal drip may benefit from the drying effect of an anticholinergic nasal spray such as Atrovent nasal (nasal ipratropium) and seem to be most helpful in vasomotor and gustatory rhinitis. Rhinitis during pregnancy can respond to saline nose sprays, and rhinitis medicamentosa requires stopping the over-the-counter topical decongestant and often replacing it with a prescription nasal spray. Treatment of other forms of non-allergic rhinitis may be patient-specific and require the care of a physician. Allergy shots, or immunotherapy, are ineffective in the treatment of non-allergic rhinitis. 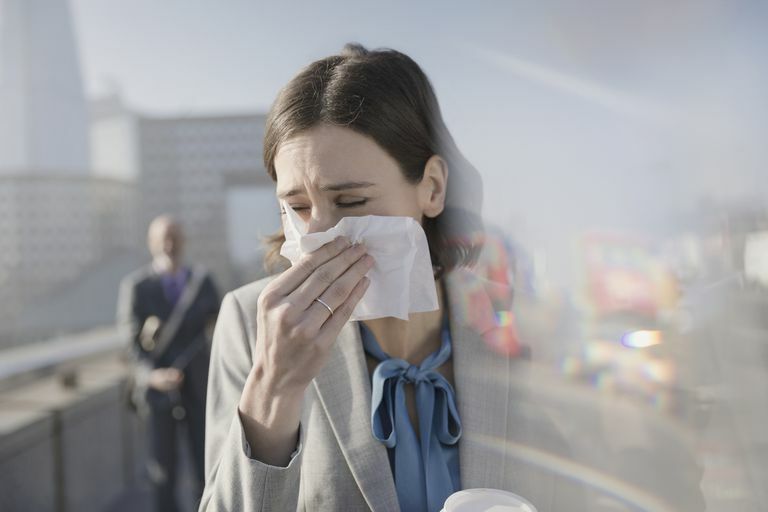 Non-allergic rhinitis can look a lot like allergic rhinitis, but since it doesn't respond to medications directed at allergies it's important to determine which type of rhinitis you are suffering from. Since many people with allergic rhinitis also suffer from non-allergic rhinitis this can be difficult. It often takes testing to rule out allergies to determine the cause, unless an obvious cause, such as pregnancy, is present. Keep in mind that symptoms of non-allergic rhinitis may also indicate a chronic sinus infection which requires a different approach to treatment. Talk to your doctor about your symptoms especially if you don't find relief with your current treatments. Baroody, F. Nonallergic Rhinitis: Mechanism of Action. Immunology and Allergy Clinics of North America. 2016. 36(2):279-87. Eifan, A., and S. Durham. Pathogenesis of Rhinitis. Clinical and Experimental Allergy. 2016. 46(9):1139-51. Poddighe, D., Gelardi, M., Licari, A., Del Guidice, M., and G. Marseglia. Non-Allergic Rhinitis in Children: Epidemiological Aspects, Pathological Features, Diagnostic Methodology and Clinical Management. World Journal of Methodology. 2016/ 6(4):200-213.